This home is decorated very nicely, lots of good light. Very kid friendly. You will feel right at home! Small private fenced back yard with grill/table and seating for 6. Three bedrooms; master with queen bed is large enough for portable crib and kids in sleeping bags. The other two bedrooms have a double bed in each. Fully equipped kitchen (sorry, no dishwasher) and dining room allows for cooking in if you want. Large living room and a family room with pullout sofa allows to sleep 8 comfortably. Linens include beach towels to lessen your packing needs, also lots of board games. The train track is right next to us. It comes through twice at night. Trains don't run during the day. There is always a jar of pennies at the house so the kids can place a penny on the tracks and look for it the next morning. The charming downtown of Grand Haven is a short, walkable 5 blocks away. Shopping, great restaurants, bars and activities for kids and adults. Chinook Pier is 4-5 blocks away where you can rent bikes or boats, get ice cream, play miniature golf, or take the boardwalk out to the lighthouse and beach. If you go all the way to the beach, it is about a mile walk/ride. In our opinion, Grand Haven is the best town along Lake Michigan. We love that the water is so close to downtown. From our house, we can walk downtown to have dinner, walk the boardwalk out to see the sunset on the lake and walk back home without having to find parking. It is always a great day to be in Grand Haven! Air conditioning basically throughout the house, not central air. Window Air conditioner in the upstairs bedroom , in front living room that takes care of front of house. New this year is a wall unit in the back of the house that covers the third bedroom and the TV room. One in family room Netflix stick available, bring your own password! nice clean place with plenty of room and great kitchen setup. We only had two people but would fit a family well. The only thing I would have liked is a TV with more stations. Loved the rental, it was clean and quirky being an older home, the floors slopped a bit, the layout of rooms was unique with additions, which gave us room to spread out. The shower heads/pressure could use work, but the rest was great. The kids loved the train tracks so close and came home with all kinds of smashed coins as souvenirs! Walkable to downtown GH, quick drive to State Park. We would rent from Renee again, thanks Renee! 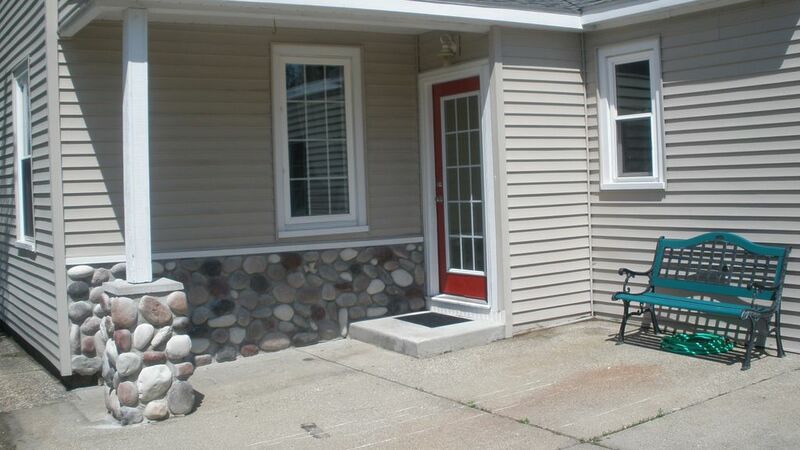 Great home within walking distance to downtown Grand Haven and wonderful restaurants. The layout of the home was great with two seating areas, one a TV room and the second was a large space for gathering on comfy furniture. Two bedrooms and full bath were on the main floor with a great master suite upstairs. The dining room table seats six comfortably for meals and games. The kitchen is well stocked with pans, dishes and plenty of glassware. We were informed of a train that runs twice a day. As the house is right next to the tracks we were somewhat hesitant to rent this home. So glad we rented anyway as the train was not a problem. In fact, it was a highlight when it went by and our dog loved it. Working with the owner was great and she even dropped off a crockpot for our use. We hope to go back in the future. We really enjoyed our stay in this house! We had 7 people there at one point and there was still plenty of room! The house was clean and met all of our family’s needs. It was so close to down town and chinook pier which we just walked to most of the time. Before our stay, I was a little nervous about the train being in such close proximity but the train turned out to be one of the highlights of the trip! My kids made sure to always have a steady supply of pennies on the track and each time it would come by everyone would run outside (kids and adults) to see it go by. My 5 year old son was in heaven! It was so cool to see the pennies flattened. We have a whole collection now! We really enjoyed our stay and appreciate that Renee allows pets. This was our first vacation with our dog which was so cool to be able to do. Renee takes great care of the house and her guests needs. When we arrived, there was an issue with the upstairs bathtub drain from the previous guests. Renee had a plumber come out the house right away and the problem was fixed before it was even a problem for us! Thanks for a great week!! Great things about the house include a big kitchen, comfortable couches, 2 living rooms, a fenced in grassy patch for dogs, great upstairs suite with bathroom and lots of natural light! Things we didn't like: the mattresses are really bad. Painful. The house could use a deep clean, not just the most used areas. There aren't any microwave-safe bowls in the kitchen. And lastly, the only TV that worked was their Netflix, which we couldn't actually use because it was being used on another screen. Thankfully someone was back home who could look up my Netflix password for my own account, but it would be an easy fix if the owner's account was upgraded to 2 screens. The House is in a great location that's very close to shops and the water. It's got everything you need for a great stay. Grand Haven is a very nice fun town. Thank you so much! We love the house and are always happy to hear that it works out well for others. Grand Haven is the best in our eyes!